The only detailed gunsmithing and repair manual published on the original Six Series Ruger D.A. Revolvers. 100's of crystal clear photos and illustrations. Click here for a sample page from the book. Volume I covers troubleshooting & problem solving; timing; parts inspection and replacement; and complete repair and rebuilding of the Ruger Six-Series Double Actions - models include the Security-Six, Police Service-Six, and Speed-Six Double Action Revolvers. 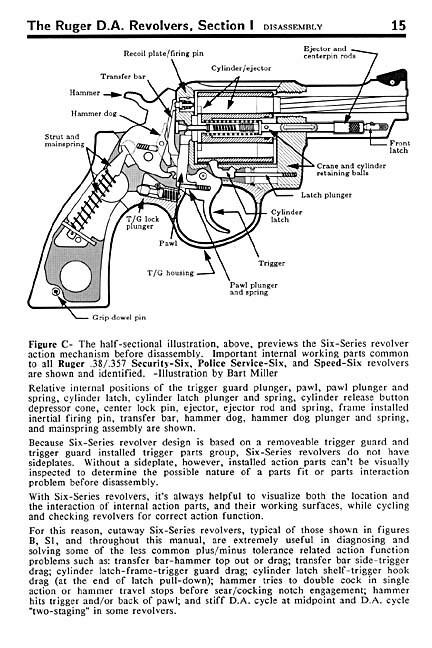 In this book, the author places attention on Six-Series' special design features, including interaction of the trigger & transfer bar with the hammer & firing pin. Important action design related subjects are covered in detail including: trigger and cylinder latch fitting for correct latch pull down and smooth trigger return; pawl (cylinder hand) fitting and adjustment; proper cylinder carry up/rotation; on-time cylinder latch drop, and smooth action function. This information packed manual provides a wealth of practical information on these unique revolvers. With over a million made, the Six-Series Double Action Revolvers were the parent design for Ruger's later Redhawk, Super Redhawk, and GP Series double actions. Bench edition - 174 pages with soft cover.